There’s a certain understated grace that radiates off Anne King, a seven-year resident of The Trace in Covington, Louisiana. It’s reflected in the way she answers questions, the way she handles the frustrations of fellow residents, and the way she is able to express incredible objectiveness about the gratitudes of her life. Spent 15 minutes on the phone with this 87-year-old Louisiana native and you’d never guess that she wears two hearing aids and is legally blind. She has taken the loss of her sight and hearing in stride, because she had it when she needed it most. King moved into The Trace with her husband in 2010 when he was suffering badly from Parkinson’s disease. 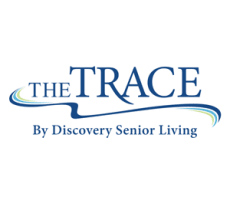 She admits she didn’t initially like living at The Trace because her health was intact while her husband took too it more naturally. That opinion changed dramatically over time. King is able to see the give-and-take of the world more easily than most. A native of New Orleans, King lived in the Crescent City until she was 22 when she and her husband moved to San Francisco as part of his military service. The pair returned home and moved around the state before buying their dream home in Kenner where they lived for 37 years. From there it was on to Covington’s Crestwood Estates, during which time the now-retired Kings started giving back to their community whenever possible. The irony that her husband pushed wheelchairs for years the ended up in one is not lost on King, nor is the fact that she was once caring for others, only to now be the one being cared for. Margaret Claiborne is 88 years old. Her eyesight is diminishing. Her back is broken in three places that can’t be repaired, and she can’t take painkillers for it because it interferes with another medication she needs. So what does she say when people ask her if she’s happy living at The Trace in Covington, Louisiana? Born and raised in New Orleans, Claiborne has been a sailor, a teacher, the manager of a law firm, and the wife of a man with some of the deepest ties to the roots of all things Louisiana. Her husband, Charles Claiborne, as the great-great grandson of the first governor of Louisiana, William C. C. Claiborne.Charles’s first cousin is Elizabeth Claiborne, the American fashion mogul. Despite the famous connections, Margaret was a lot more impressed with Charles her husband rather than the Claiborne name. Margaret learned to love sailing with her first husband, who was an Olympic-caliber competitor in the sport. She went on to teach mostly in private Catholic high schools in New Orleans throughout the 1950s. After a long tour of Europe, she came home and worked with mentally-challenged children. She got burned out on it after a time and went to manage a dress store, but found herself missing the interactions with the kids, and she re-entered the teaching field. Charles Claiborne died of cancer in 1984. Margaret went on working as the manager of a law firm before retiring at 75, then found herself with disturbingly little to do. While other senior citizens often go unwillingly into senior care, it has never been a concern for Claiborne.